After the collapse of the Iron Curtain and the de facto end of the Cold War, the Danish Ministry of Defence decided to replace the fleet of aging Leopard 1A3 currently in service with Leopard 2A4 MBT's purchased second hand from Germany in 1997. It was immediately recognized that the Leopard 2A4 was an interim solution, and work began to define the modifications that would be required to meet the needs of the Danish operators. Testing began with 11 of the newly delivered vehicles by the 1st squadron of the 3rd battalion of the Jutland Dragoon Regiment (Jydske Dragonregiment) in 2000 and 2001. 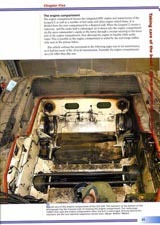 Results of this testing process and the many lessons learned from the continuous upgrade of the Leopard 1A3's were combined to form the required modifications for a Danish Leopard 2. 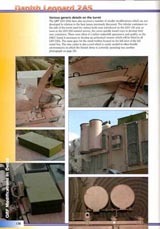 With the requirements not completely formulated, the Danish Ministry of Defence signed a contract with Krauss-Maffei Wegmann in 2000 to upgrade the Leopard 2A4's. The result of the upgrade program was the Leopard 2A5 DK, which was to represent the most technologically advanced Leopard 2 at that time. This book by Thomas Antonsen strives to tell the story of the Leopard 2A5 in Danish service, from early trials with the 2A4 right up to present day modifications such as the installation of slat armour and Barracuda camouflage mats on vehicles on operations in Afghanistan. The book is 172 pages in length with full English text, hard cover and contains all colour photos printed on high quality glossy paper. Readers familiar with the Barbarossa Leopard 1 trilogy will recognize the page layout, which is both easy on the eyes and aesthetically pleasing. The first thing I noticed while eagerly flipping through the book for the first time was that it was clearly written by a modeller for modellers. 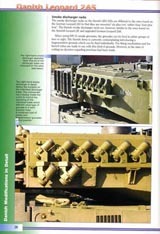 The book is first and foremost a modeller's photographic reference which documents in detail the modification that make this vehicle uniquely Danish. 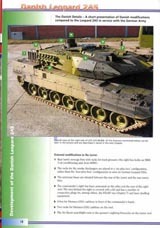 Notable areas on the Leopard 2A5 DK have been presented with photographs shot from multiple angles (a scratch builders dream). This is something I've personally wanted to see in armour reference books for ages! The book contains numerous photos of vehicles of the Jutland Dragoon Regiment (or Jydske Dragonregiment), as the author lives 35 km from the Holstebro barracks (lucky sod) where all of the Danish Army's Leopards are based. 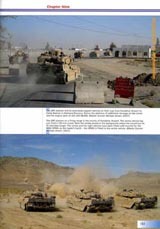 The book contains an excellent mix of in-action and detail photos, in addition to a number of excellent shots of vehicles on operations in Helmand Province, Afghanistan. A nice bonus is the inclusion of two KMW engineering drawings (top and left side views) of the 2A5 DK in 1:35 in addition to smaller illustrations of the official factory applied camouflage pattern. However, I found myself wishing for an engineering drawing of the rear and right side of the vehicle which would illustrate the under armour APU housing particular to the 2A5 DK (this is a tiny knit-pick as there are plenty of photos of said APU housing). 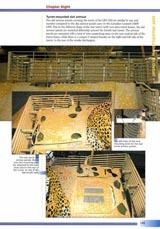 The text and captions are very well written and extremely informative and helpful. The author has written each caption with the goal of providing as much useful information as possible to the AMS afflicted modeller. Accurate and descriptive captions are something I've been wishing for in armour reference books for a long time, as they are unfortunately not the norm. Once I had finished reading the book from cover to cover, I felt that I had learned an awful lot about the Leopard 2A5 DK, and the Leopard 2 in general. As can be noted, the book provides a veritable feast of photos and information that should delight modellers wishing to tackle a 2A5 DK. There is however one tiny omission from this impressive body of work, and I hesitate to mention it as I feel that I'm really knit-picking here. 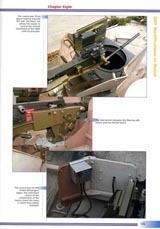 The book fails to mention the fact that the clasps and brackets for the pioneer and vehicle maintenance tools mounted on the engine deck are different than those used on German Leopard 2's. There are however numerous photos of the Danish style tool clasps, so this oversight is quite minor and does not detract from the overall impressive quality of the book. The Leopard 2A5 DK has previously existed somewhat in the shadows, with reference material being quite sparse and limited in breadth. This book has shed new light on a very interesting variant of what is clearly one of the most prolific MBTs in use by Western nations today. The author has created a body of work which is both an engaging read as well as an extremely valuable collection of reference material for Danish armour modellers and Leopard 2 enthusiasts alike. In the introduction, the author states that one of his primary goals in writing the book was to create an ideal armour reference book. I think he has succeeded in this endeavour most admirably, and I sincerely thank him for writing such a splendid book.